Towards the end of the Nineteenth Century, the Great Northern Railway's (GNR) passenger locomotive stock was having difficulties keeping up with traffic developments. The single-wheelers of the day could not cope with the faster speeds and heavier loads that were being seen. With this background, on 1st November 1895 the GNR Board appointed Ivatt to replace Stirling. 75 years old, Stirling died ten days later. Although Ivatt's first locomotives were merely modifications of Stirling types (E1 2-4-0 and D4 4-4-0), it appears that he was considering the Atlantic 4-4-2 wheel arrangement before his appointment with the GNR. He was given permission to build an experimental 4-4-2 in February 1897, and one year later No. 990 was completed. This was the first Atlantic 4-4-2 locomotive built in Britain, and quickly acquired the nickname of 'Klondike' (or 'Klondyke') after the 1896 Gold Rush in the Klondike region of the Yukon. In June 1900, No. 990 was named Henry Oakley, but the 'Klondike' name stuck and was used for the entire class throughout their existence. No. 990 had an unusual extension ring at the front of the boiler. This 1ft 11in ring was to allow the front of the boiler to be anchored to the cylinder castings. The overall effect was for the smoke box to be 1ft 11in longer than it appeared from the outside. Ten more Klondikes were built in 1900, followed by a four-cylinder version (No. 271) in 1902. With small cylinders, No. 271 was not a great success and was rebuilt to match the other Klondikes in 1911. Meanwhile, from 1901 the basic Klondike boiler design was being used on the new 0-8-0 goods engines (LNER Q1 & Q2), and from 1903 on the 0-8-2T (LNER R1). The next development was No. 251 which featured a larger boiler. This would become the first of the LNER C1 class, but a further batch of ten 'Klondikes' were built in 1903. The fitting of superheaters started in 1909, with the fitting of a Schmidt superheater to No. 988. Dr. Schmidt also insisted on the fitting of piston valves at the same time. From 1914, the fitting of Robinson superheaters to the other C2s started. This was completed by the LNER in 1925. In line with contemporary thinking, the fitting of superheaters was accompanied by a reduction in boiler pressure from 175psi to 160psi. This was compensated for, by increasing the cylinder diameter to 19in diameter. Piston valves would eventually be fitted to twelve of the Klondikes. Gresley fitted his twin-tube superheater to No. 950 in 1916, and Nos 255 & 989 in 1919. This design had two headers: one at the top, and one at the bottom of the smokebox. These were fitted with the standard 18-element Robinson superheaters between 1927 and 1928. In 1913, No. 252's smokebox was extended by 1ft 2.75in to act as a simple spark arrestor. All but four of the C2s were similarly altered by Grouping (1923). Two of these were converted, but Nos. 3984 & 3985 kept their short smokeboxes until they were withdrawn. Cracked frames were often repaired by replacing one side only. Over time, the frame design was modified slightly. From 1919, the frame depth near the cylinders was increased by 2.5in, and an additional row of bolts was often added. It was not unusual for this modified design to be seen on one side of a locomotive but not the other. In fact, the preserved No. 990 has this deeper frame on the right-hand side, but keeps the older frame design on the left-hand side! The C2 Klondykes were initially distributed between the GNR's main line sheds. In 1905, they were allocated to Kings Cross, Peterborough, Grantham, and Doncaster sheds. Their early duties consisted of the heavier expresses on the GNR main line from London to York. These services were not very fast in the early 20th Century, and the C2s could keep up even if they tended to be slow when climbing uphill. By 1913, all of the C1s were in service, and the Klondikes tended to be seen on the easier relief expresses. However, they were still called upon to pull some heavy trains during World War 1. By 1920, the C1s had replaced many of the C2s at Grantham and Doncaster, with the displaced C2s joining the other main line sheds. By 1923, three were allocated to Cambridge to haul the London to Hitchin passenger services. In 1924, the ex-North Eastern Railway (NER) shed at Starbeck received a C2 to haul the Ripon to Doncaster leg of the Ripon to London service. In the following year, the NE area would receive more C2s for working between Leeds, Hull, Scarborough, and Newcastle. As well as pulling secondary passenger services, the C2s often pulled fish trains during the 1920s until these duties were taken over by K2s and K3s. Throughout the 1920s and early 1930s, the C2 Klondikes would continue to pull secondary passenger services and deputise for C1s on faster services. In 1935, the Klondikes were in need of new boilers, but were regarded as being too weak for the current traffic needs. Withdrawals commenced immediately, but five were still in service by 1939. Withdrawals were postponed for World War 2, but the last five engines were withdrawn in 1945. No. 3990 Henry Oakley has survived into preservation. The following details are for the locomotives with piston valves, and 18-element Robinson superheaters. Those that still had slide valves, had 19x24in cylinders and a quoted tractive effort of 15,649 lb. At the time of Grouping (1923), No. 3271 (GNR No. 271) had two 18.5x26in inside cylinders with Stephenson valve gear and 8in piston valves. Tractive effort was quoted at 16,071 lb, with an engine weight of 58 tons 13 cwt. Heating Surface: Total: 1370.75 sq.ft. When No. 3990 Henry Oakley (GNR No. 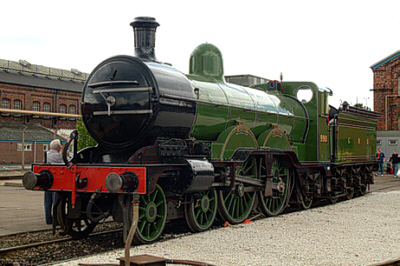 990) was withdrawn at the end of 1937, it was restored to a GNR livery and placed in the York Museum in January 1938. In 1953, No. 990 was restored to running condition and ran a series of specials with C1 No. 251 celebrating the centenary of Doncaster Works. No. 990 was steamed again in 1975 for the Stockton & Darlington 150th anniversary celebrations, before entering the National Railway Museum in 1975 as a part of the National Collection. During the summer of 1977, Henry Oakley was loaned to the Keighley & Worth Valley Railway to haul passenger trains. No. 3990 Henry Oakley is currently on loan to Bressingham Steam Museum and Gardens, where it is exhibited in a static condition. DJH sell a whitemetal kit of the C2 'Klondike' for 4mm scale (OO gauge). An O gauge (7mm scale) kit is available from ACE Products. Of the twenty two C2s, only the first C2 to be built carried a name. No. 990 Henry Oakley was named in June 1900, and carried the LNER number of 3990. It had both a superheater and piston valves fitted in December 1922. Thank you to Malcolm Peirson for the photograph of LNER No. 3258. Thank you to Geoff Byman FRPS for the photograph of the C2 No. 3990 Henry Oakley at the Doncaster 150 celebrations.